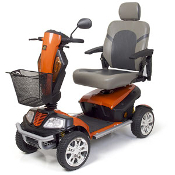 We are your local Mobility Equipment dealer. Scooters scooters scooters, Its that time of year when everyone is looking to get out of the house. We carry a full line of mobility scooters. 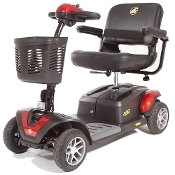 Golden Technologies is one of the premier mobility scooter manufactures. Their Buzzaround line is one of the best travel scooters on the market. Below is some insurance information that might answer some questions why insurance may or may not cover the purchase of a scooter. Question: Can I get a scooter through Medicare in New York State? Answer: In most cases the answer is NO. See more detailed answers at the bottom of this page. Question: Will insurance pay for a new scooter if I live at home? Answer: The short answer is no. If you live at home and want to use the scooter to do things like go shopping, travel or go to an event your insurance company will not pay for the scooter. As matter of fact the only time insurance will pay for the scooter is if you need it to get from your living room, to the bedroom and to the bathroom. 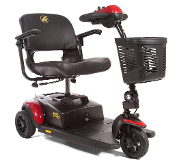 Question: Will insurance pay for a new scooter if I live in nursing home or assisted living? Answer: The short answer is no. If you live in assisted living your insurance company is paying the facility a large amount of money to take care of you. The insurance company feels that the facility should provide adequate transportation to and from your room. Question: Will insurance pay for a new scooter if I live in an independent living center? Answer: The short answer is maybe. If you live in an independent living center and need assistance getting down to the dining area and a walker or cane can not be used then yes. Now the second part of that question should be who will bill to my insurance since they will only except $781.49 for payment (NY Medicare 2017 HIPCC Code K0800 scooter with 300lbs weigh capacity). That answer is no one. This is why when you call around every provider will tell you they will not issue a scooter but rather a power wheelchair that pays more. Now this is where we come in. We don't deal with insurance, so we can charge less. We take a scooter that has a retail price of $1599 and sell it for $949. We don't need a 5 man billing team, fax machines, accreditations and all the things that come with selling to Medicare. We keep it simple, cash up front we deliver.